Tarmak is a toolkit for Kubernetes cluster lifecycle management. It focuses on best practice cluster security and cluster management/operation. It has been built from the ground-up to be cloud provider-agnostic and hence provides a means for consistent and reliable cluster deployment and management, across clouds and on-premises environments. Tarmak and its underlying components are the product of Jetstack’s work with its customers to build and deploy Kubernetes in production at scale. Build and manage as similar as possible cluster deployments across different cloud and on-premises environments. Combine tried-and-tested and well-understood system tools throughout the stack to provide production-ready and ready-to-use clusters. Support for a fully automated CI/CD operation. Provide minimally invasive upgrades, which can be predicted using dry-runs. Have a testable code base, that follows KISS and DRY. For example, avoidance of convoluted bash scripts that are environment and operating system-specific. Provide a tool-independent CLI experience, that simplifies common tasks and allows to investigate cluster status and health quickly and easily. Allow customisation to parts of the code, to follow internal standards. A high-level architecture diagram is coming soon! The Tarmak configuration uses Kubernetes’ API tooling and consists of various different resources. While the Tarmak specific resources (Providers and Environments) are defined by the Tarmak project, Clusters are derived from a draft version of the Cluster API. This is a community effort to have a standardised way of defining Kubernetes clusters. By default, Tarmak configuration is located in ~/.tarmak/tarmak.yaml. Although we do not anticipate breaking changes in our configuration, at this stage this cannot be absolutely guaranteed. Through the use of the Kubernetes API tooling, we have the option of migrating between different versions of the configuration in a controlled way. A Provider contains credentials for and information about cloud provider accounts. A single Provider can be used for many Environments, while every Environment has to be associated with exactly one Provider. Currently, the only supported Provider is Amazon. An Amazon Provider object references credentials to make use of an AWS account to provision resources. An Environment consists of one or more Clusters. If an Environment has exactly one cluster, it is called a Single Cluster Environment. A Cluster in such an environment also contains the Environment-wide tooling. For Multi-Cluster Environments, these components are placed in a special hub Cluster resource. This enables reuse of bastion and Vault nodes throughout all Clusters. A Cluster resource represents exactly one Kubernetes cluster. The only exception being the hub in a Multi Cluster Environment. Hubs do not contain a Kubernetes cluster, as they are just where the Environment-wide tooling is placed. All instances in a Cluster are defined by an InstancePool. This is what a single cluster, production setup might look like. While the dev environment allows for multiple clusters (e.g. 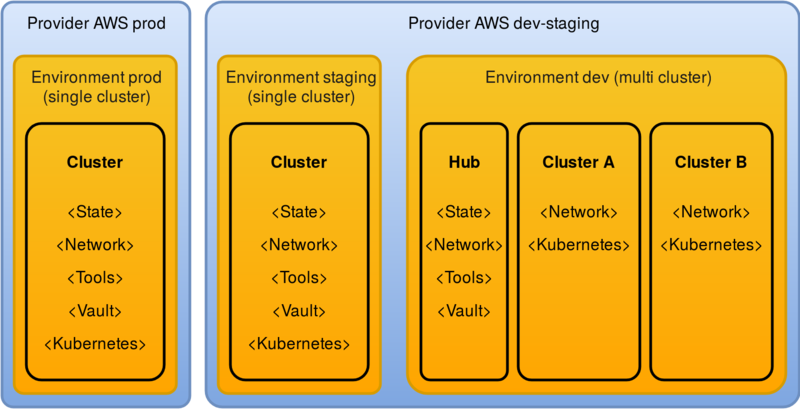 each with different features and/or team members), the staging and production environments consist of a single cluster each. The same AWS account is used for the dev and staging environment, while production runs in separate account. Every Cluster contains InstancePools that group instances of a similar type together. Every InstancePool has a name and role attached to it. Other parameters allow us to customise the instances regarding size, count and location. bastion: Bastion instance within the tools stack. Has a public IP address and allows Tarmak to connect to other instances that only have private IP addresses. vault: Vault instance within the vault stack. Has persistent disks, that back a Consul cluster, which backs Vault itself. etcd: Stateful instances within kubernetes stack. etcd is the key-value store backing Kubernetes and potentially other components, overlay networks such as Calico for example. master: Stateless Kubernetes master instances. worker: Stateless Kubernetes worker instances. Docker is used to package the tools necessary and run them in a uniform environment across different operating systems. This allows Tarmak to run on Linux and macOS (as well as potentially Windows in the future). Packer helps build reproducible VM images for various environments. Using Packer, we build custom VM images containing the latest kernel upgrades and supported puppet version. Terraform is a well-known tool for infrastructure provisioning in public and private clouds. We use Terraform to manage the lifecycle of resources and store cluster state. As soon as instances are spun up, Tarmak uses Puppet to configure them. Puppet is used in a ‘masterless’ architecture, so as to avoid the complexity of a full Puppet master setup. All the services are configured in such a way that, once converged, the instance can run independently of Puppet. Why Puppet over other means of configuration (i.e. bash scripts, Ansible, Chef)? The main reason is its testability (at various levels) as well as the concept of explicit dependency definition (allowing a tree of dependencies to be built helping predict the changes with a dry-run). Tarmak uses Systemd units and timers. Units are used to maintain the dependencies between services while timers enable periodic application execution - e.g. for certificate renewal.